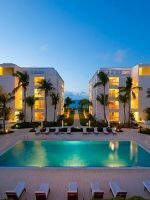 Offering all-suite accommodations right on the renowned Grace Bay Beach, The Palms features lots of fun and convenient amenities. 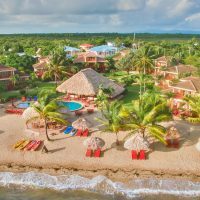 All of the large suites at this resort feature spacious living areas, modern kitchens/kitchenettes, private balconies/terraces, sleeper sofas, in-suite laundry facilities, cable television and DVD/CD players. Studios, one-, two- and three-bedroom units are available. 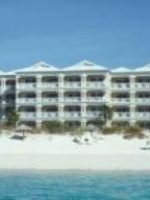 The larger accommodations have private laundry facilities and full kitchens with dishwashers. Cribs are available upon request. Children 12 and under stay free. 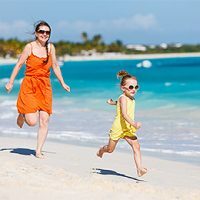 The resort offers many family-friendly activities and amenities, including a kids’ club for children 12 and younger, and complimentary use of snorkeling equipment, beach toys, floats, kayaks and Hobie Cat sailboats. There’s also a fitness center and a tennis court. 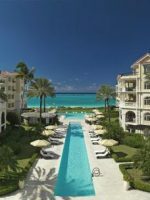 The property encompasses a large infinity pool that overlooks the Caribbean Sea, a full-service spa, a mini food market, upscale boutiques and an art gallery. 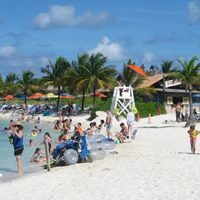 There are several restaurants and bars onsite, and packed lunches, as well as beach- and poolside service are available. Breakfast, parking and Wi-Fi are complimentary. Spring break vacation. Absolutely delightful. Pool staff went out of their way every day to be sure we were taken care of. The grounds and rooms are immaculate. The morning breakfast was delicious. Can’t wait to go back! Plenty of room and great view of the beach. Our Butler Jerome was so helpful arranging logistics and reservations for us. He took a lot of the stress of planning our nightly meals and arranging transportation. 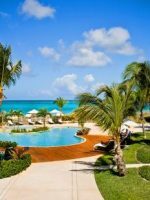 One tip, if your traveling with a large group and planning on visiting sites outside of the resort. Look into renting a car, the taxi services are nationalized, its $5 per person just to go a short distance, then about $1 per mile after that. The spa and relaxation area were perfect for meditation and yoga. The complimentary breakfast buffet was 5 star. Resort restaurants were good but not great.